Crispy baked garlic fries are cooked in foil packets for an easy side dish with minimal clean-up. I love making foil packet meals. So far I’ve shared foil sheet pan shrimp boil and ranch salmon in foil packets. And today, I’m sharing these easy garlic fries. The fries are baked instead of fried, so they are a little healthier than traditional fries. The potato wedges are brushed with olive oil and garlic. Then they are sealed in foil packets, locking in the moisture and allowing the potatoes to cook quickly. Once the potatoes are tender, you broil them until crispy. I also added some parmesan cheese. These cheesy garlic fries come out super flavorful. And because they are cooked in foil packets, the clean-up is easy too. 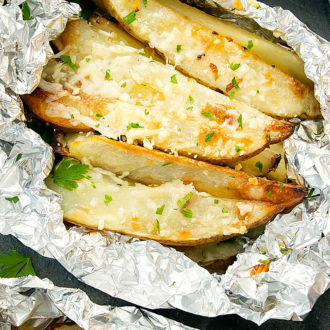 Baked crispy garlic fries are cooked in foil packets for easy clean-up. Preheat oven to 400°F. 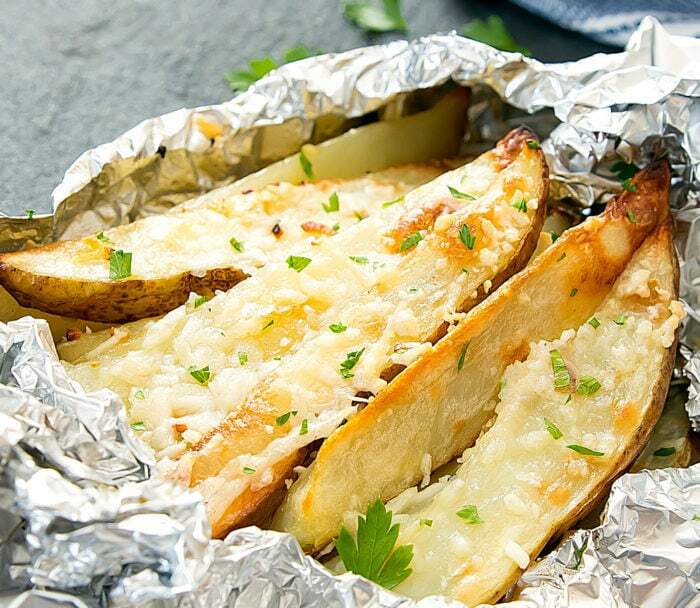 Cut a sheet of foil large enough to fit all the potato wedges and seal them. You can either make one large packet or 3 small packets for individual servings. Fold up sides of foil to form a loose boat. Lightly brush the inside of the foil boat with oil. 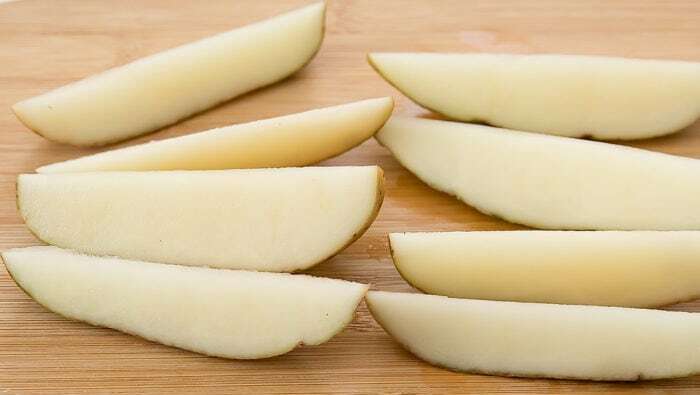 Place potatoes into foil and brush all sides of the potato wedges with oil. Sprinkle garlic evenly across potatoes. 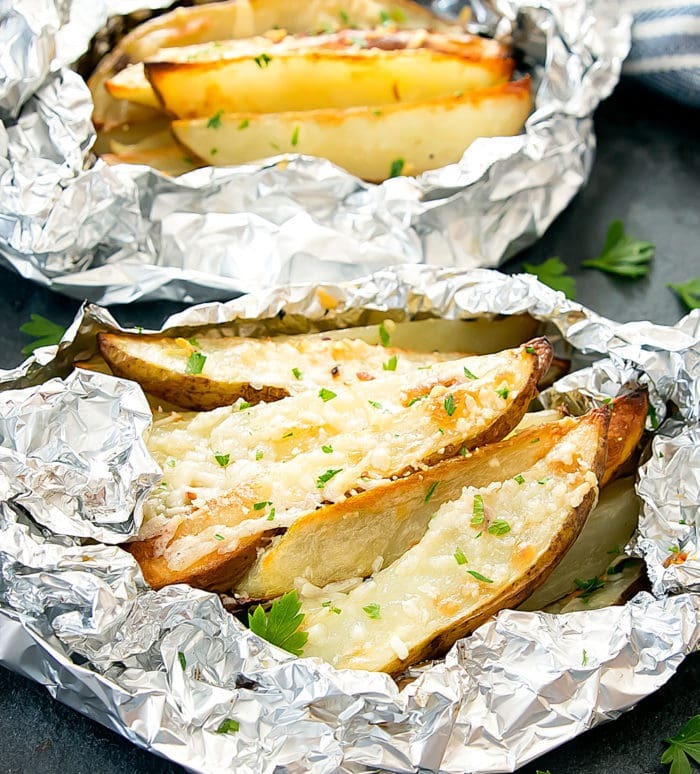 Cover potatoes with foil and seal edges. 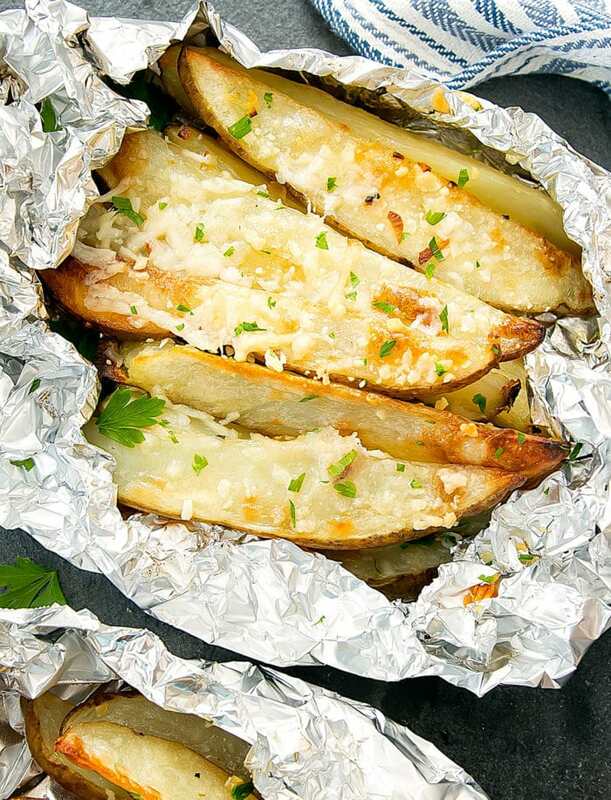 Place foil packets onto a baking sheet. Bake potatoes for about 30 minutes or until tender. 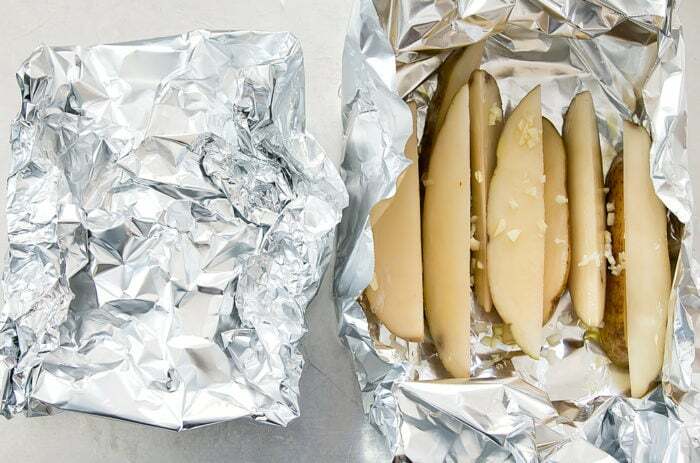 Open up foil packet(s) and spread potatoes out so they are not overlapping, with the skin side facing up. Sprinkle with cheese. Sprinkle with salt, if desired. Place potatoes back into oven and switch oven to broil. Broil potatoes until edges turn crisp and cheese is melted (this took around 5 minutes for me, but you should watch your potatoes closely so they don't burn). Remove potatoes from oven. Garnish with parsley. Serve while potatoes are still crispy. I love foil packet meals, but I have never thought to do fries in them! 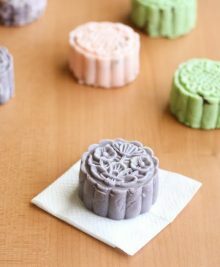 These look fabulous, I can’t wait to try them! 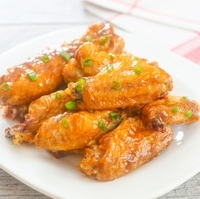 Would turning the oven temperature up to 450°F work well too if not using Broil? Thanks. This recipe sounds super easy and I happen to have a big bag of potatoes at home from the sale at Sprouts.